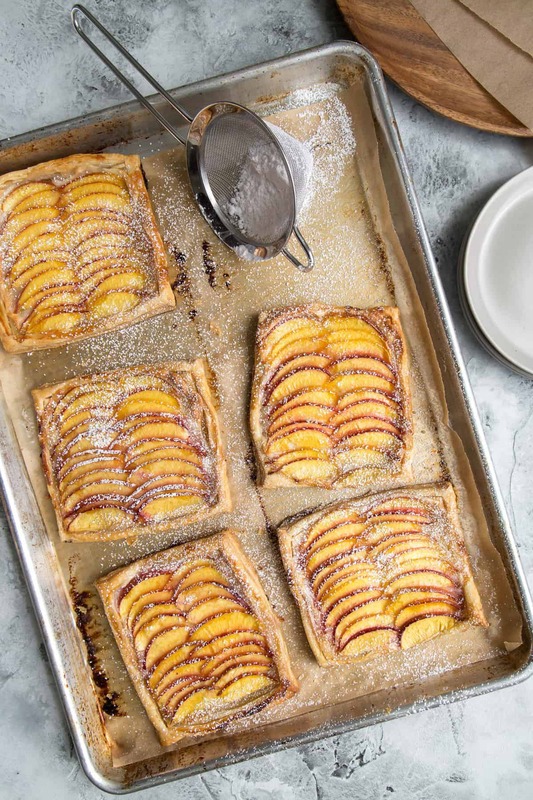 These quick and easy to make nectarine puff pastry tarts are filled with vanilla bean cream cheese. These make for a delicious breakfast or afternoon snack. 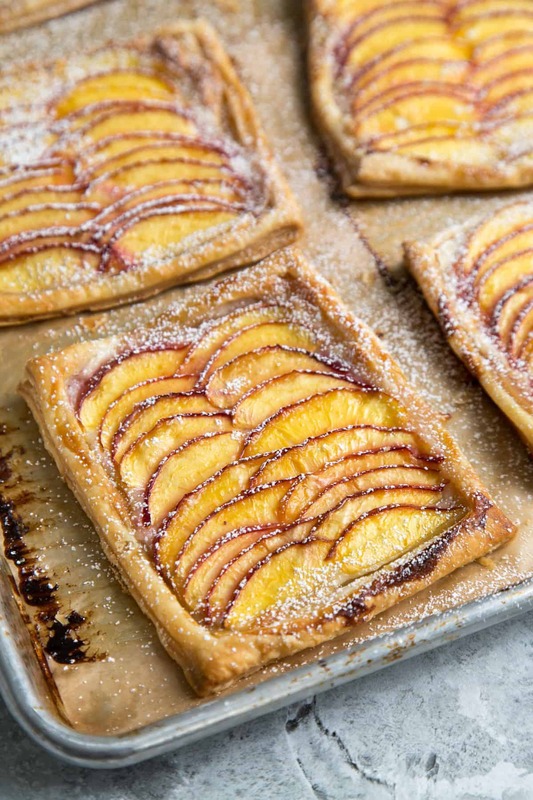 My husband claims these nectarine puff pastry tarts tastes like a better Toaster Strudel. At first I was disappointed and a bit offended. How could these tarts made with fresh fruit be compared to that thing? First of all, I’m not the biggest fan of Toaster Strudel. Growing up, I was a Pop-Tarts fiend. And to be completely honest, I still love Pop-Tarts. After finishing off one puff pastry tart in less than 90 seconds, Alex proceeded to explain. His comment was actually a compliment. He loves Toaster Strudel’s flakey crust and gooey filling. The flakey puff pastry with the tasty vanilla cream cheese and sweet fruit reminded him of happy childhood breakfasts. I always have a stash of frozen puff pastry sheets in the freezer. They’re a super versatile and easy to use product. I buy them precut in 5-inch square sheets. If you buy the larger sheets, simply cut the puff pastry to your desired size. You can also bake a larger puff pastry tart and slice into servings afterward. Start by defrosting the frozen puff pastry sheet. Use a knife to score a border about 1 centimeter away from the edges. Be careful not to completely cut through the puff pastry sheet. Spread the vanilla cream cheese within the scored border. Top with nectarine slices and sprinkle with a little bit of turbinado sugar. I sliced the nectarine very thin, but you can slice it thicker if you prefer. Pop them in a hot oven and within 30 minutes you’ll have a delicious home baked treat that rivals those baked goods from your favorite coffee shop. Asides from nectarines and other stone fruits, this recipe works well with sliced strawberries or apples. A few years ago I made a similar version with blackberries and honey cream cheese. Score a 1 cm border around the puff pastry square. Spread about 1 1/2 tablespoons of vanilla cream cheese on each square, staying within the scored border. 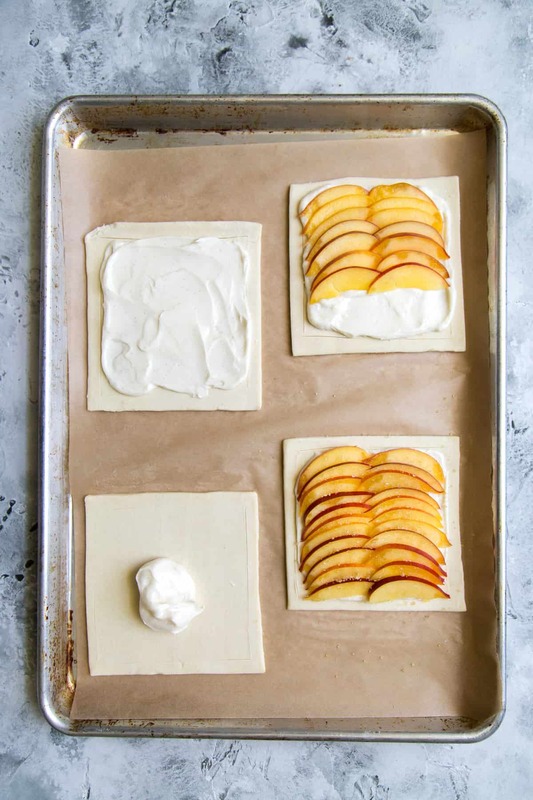 Place nectarine slices on top of cream cheese. Sprinkle 1/2 teaspoon of turbinado sugar over nectarine slices. Bake for 20-25 minutes until puff pastry is golden brown. Allow to cool slightly before dusting with powdered sugar. Serve warm or at room temperature. Using a hand mixer or stand mixer, beat cream cheese and butter until smooth. Add powdered sugar, vanilla paste, and salt. Mix until thoroughly combined. I use puff pastry that is already cut down to 5-inch squares. You can buy a large sheet of frozen puff pastry and cut it down to your desired size. Store leftover puff pastry tarts in the fridge. Reheat in a toaster oven. i definitely would have been like, EXCUSE ME, TOASTER STRUDELS? ?, too. my brother’s like that, and compliments things if they taste packaged (to him, something tasting like kraft mac and cheese is a good thing). Omg! Nectarine pastry tarts with the cream cheese, sounds yummy. . Aww, your pics look so delish. Definitely going to try to make these. This looks wonderful and easy to make, I can’t wait to try it. Ah that sounds delicious! I love baking with puff pastry! So quick and easy but still looks and tastes beautifully. Thanks for sharing, I will be trying this recipe soon! These look absolutely amazing! I love nectarines and think this would be the perfect summer dessert! These tarts are so elegant! These look amazing! I am loving the combo of puff pastry and the vanilla cream cheese! YUM! Those are gorgeous! 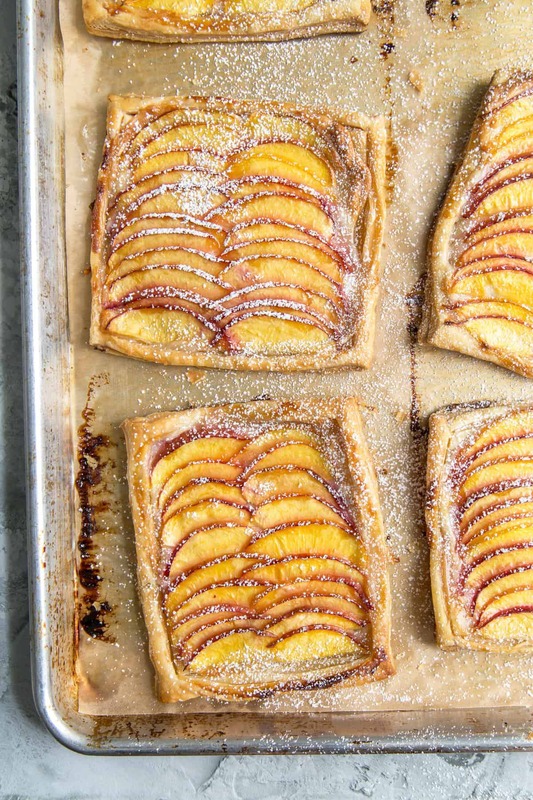 Puff pastry is one of my all-time weaknesses and combined with nectarines it’s heavenly! 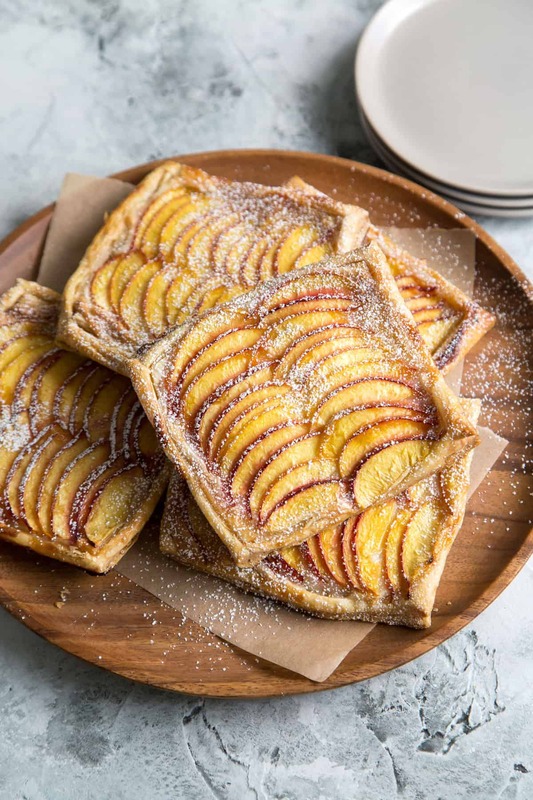 These tarts look beyond beautiful and I’ve got a nectarine in the fridge that needs using up. Yay! I LOVE this idea! They would be delicious right out of the oven with some vanilla ice cream on top….! What an elegant dessert! Perfect for summer entertaining. Wow I really cannot wait to try these! This looks so delicious. This is such an elegant looking dessert. A little whipped cream and you’re done! That looks so wonderfully delicious! YUM! Oh wow these look SO good! I may need to attempt this! Oh WOW!! These look absolutely amaaaazing! YUM!!! They squares look exactly like the one’s that my local french bakery makes. Now I can start making them at home, instead! Thanks for recipes! What gorgeous tarts! Obsessing over that vanilla bean cream! Mmmm this puff pastry recipe looks so delicious! Definitely saving it to Pinterest for later! These tarts are so appetizing! Great job! Those tarts are so cute I almost don’t want to eat them. HAHAHAHAHAHA. Who am I kidding? Those tarts wouldn’t last 3 seconds with me in the house. They look all kinds of amazing! Thanks! Haha, I had to exercise a ton of self-control to stop myself to eating too many of these tarts!